Except for those deals made around the annual trade deadline, trades involving actual NHL players coming and going on both sides have become rare indeed in the NHL during the last five seasons. So it was somewhat surprising when the news came down today that Washington has dealt captain and right wing Chris Clark and defenseman Milan Jurcina to the Columbus Blue Jackets in exchange for left wing Jason Chimera. Chimera is a 30-year-old with good size (6-foot-2, 216 pounds) and good speed. He is a gritty checking-line winger who has eight goals and 17 points to go along with a minus-7 in 39 games with the Blue Jackets this season. When the Caps clashed with Columbus at Verizon Center on Nov. 1, it was fracas with Chimera and the Blue Jackets’ Jared Boll that left Caps superstar Alex Ovechkin with an upper body injury. Ovechkin missed Washington’s next six games because of the ailment. 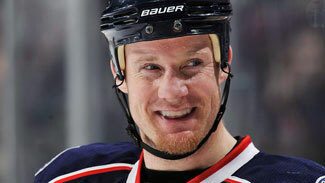 Chimera enjoyed his best NHL season with the Blue Jackets in 2006-07 when he totaled 15 goals and 36 points along with a plus-2 and 91 PIM while playing in all 82 games. Chimera recorded 17 goals for the Jackets in 2005-06, his single-season career best. A native of Edmonton, Chimera was drafted by the hometown Oilers with the team’s fifth-round pick (121st overall) in the 1997 NHL Entry Draft. Edmonton traded Chimera to Phoenix at the 2004 draft, but he never suited up for the Coyotes. Chimera was dealt from Phoenix to Columbus days prior to the start of the 2005-06 season. Chimera has 81 goals and 91 assists for 172 points and has 465 PIM in 461 career NHL contests. With left wing Fredrik Modin back in the lineup and healthy again, the Jackets had some excess on the left side. The Jackets have allowed 3.31 goals per game this season, third most in the NHL. They had a need for some bolstering on their backline. Owning a 1-9-3 mark in December, Columbus was also in need of a general shake-up. The Caps have long stated that whenever their young players proved they were worthy of holding down a regular NHL job, the team would make room for them. That would appear to be part of what this deal is all about, although it also saves the Caps a few million dollars off the salary cap. Washington defenseman Karl Alzner is clearly ready for prime time, and his recent recall from Hershey of the AHL gave the Capitals nine defensemen on the roster. Although rearguards Brian Pothier and Tom Poti are currently day-to-day with injuries, the Caps have had a logjam on the backline since the start of the season. The deal with the Blue Jackets today helps ease that glut just a bit. With Alexander Semin, Mike Knuble, Eric Fehr and Matt Bradley all performing well on the right side, Clark had been skating on the left wing of late. Coming into this season there was doubt among some as to whether or not Fehr could handle regular NHL duty, but he has posted eight goals and 18 points and is plus-10 in 28 games this season. Trailing only Rod Langway and Dale Hunter in longevity, Clark had been the third-longest serving captain in Capitals franchise history. He had the “C” sewn on his sweater prior to the 2006-07 season. The Caps’ vacant captaincy will now be open to speculation, with Alex Ovechkin’s name surging to the top of a list of several very qualified candidates. Clark came to the Caps at the start of the 2005-06 season in a deal with Calgary. He scored 20 goals in his first season with the Caps, and followed up with 30 in 2006-07. But he had been plagued by injuries the past two seasons and had just regained his form in 2009-10. Clark had appeared in all 38 of Washington’s games at the time of the trade, posting four goals and 15 points with a minus-4 and 27 PIM. With nine defensemen on the roster, something had to give. One of three Caps blueliners with impending unrestricted free agent status next summer (Brian Pothier and Shaone Morrisonn are the others), Jurcina had been with Washintgton since arriving from Boston in a Feb. 1, 2007, trade. The big right-handed-shooting blueliner had four assists and 14 PIM in 27 games with Washington this season. Chimera is in the second season of a four-year deal that pays him $1.875 annually, giving the Capitals another player who is under contract for the next two seasons beyond the current one. Clark is signed through the 2010-11 season at an annual salary cap hit of $2.633 million. Jurcina earns $1.375 million this season.